In Spring 1917 the first Americans arrived in Europe to take part in the Great War. Click on one of the small photo's below - and you'll get the full picture. American troops detraining at their destination. 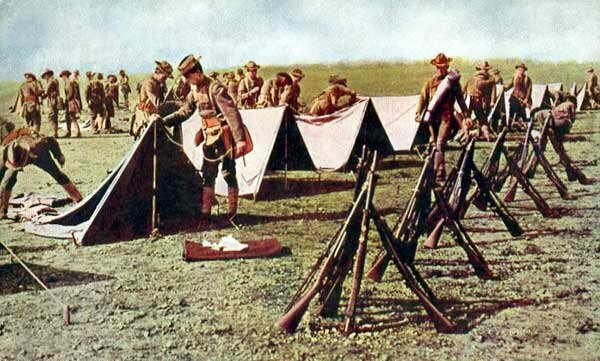 Color picture taken from Leslie's Photographic Review of the Great War, 1919. American soldiers standing in with the cook. The Brigadier pays a visit. You want to look neat if you go to war. American soldiers march in a training camp. It is 1918. The flag carries 48 stars. First aid emergency field dressing. Official navy picture, made on the US Naval Training Station, Great Lakes, Ill. Teaching recruits to lash up an hammock. Another navy picture from the Great Lakes Training Station. No more training (sic). Ready for the High Seas. Training again. Aboard an American warship. Note the bare feet. A real photograph, but badly hand colored afterwards. Preparing defence against aircraft on board of an US battleship. Note the boat-like lines of the body. It is built with what is known as pontoon construction, which enables it to alight on and rise from the water. This type of machine also has splendid rising or climbing ability so that it can fly without having to run along a great distance on the level. Because of this it is especially desirable for navy use, as it can be started from the deck of a battleship. Use of the aeroplane in the present European war has practically revolutionized modern methods of warfare. Or Aviation Corps makes up in skill and achievement what it lacks in numbers. USS Florida. Picture made in 1917. Close bow view of American dreadnought going at full speed. Stereo picture of the USS submarine K6. Picture made in 1918. To view this and other stereo pictures you need a special viewer and/or some skill. Stereo picture of USS destroyer Benham. The original byline of the picture said that this destroyer was of the latest type. Mess Time aboard ship. Stereo picture. The set of boys show the clean-cut type of American sailor with intelligence stamped on their faces. The greatest care is taken to select only the fittest and brightest type of young man in the navy. American sailors playing cards. Stereo picture. The boys are limited in their different pastimes and in cramped quarters, outside their work, there is nothing to fit in or can take the place of a game of cards. Gambling is strictly prohibited on board any of Uncle Sam's ships, but the boys will engage in Pinochle, Forty-Five, Euchre and that sort of thing. Here is a four-handed game of Whist, and it is a little bit interesting and exiting at the present moment. The boys get around in little corners out of the way between decks and enjoy this to their heart's content. Sources: Most of the pictures above come from our own collection. Others were found in books, and a few elsewhere on the Internet - RR.